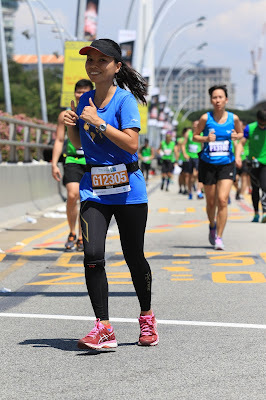 Running my first ever full marathon in the Standard Chartered Marathon here in Singapore is definitely one of the highlights of my 2016. Beyond bucket list moment. An #invest-in-experiences-not-things life goal. This #roadto42k journey did not just made me stronger physically but also thought me significant learnings I never imagine I could gain from running. Whether you are running 10km or 21km or 42km, you have to do your part in terms of preparation. Distance makes a huge difference when it comes to training. 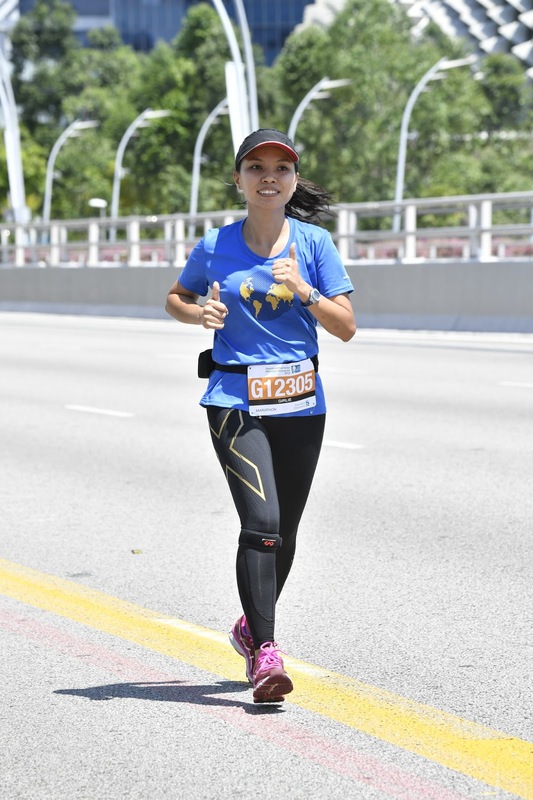 Longer distance means more commitment to training, planning for proper nutrition and choosing the right running gears that will help you endure the distance. Kudos to Rocky who has always been there during our training, constantly reminding us to respect the distance for the distance will not train for itself. 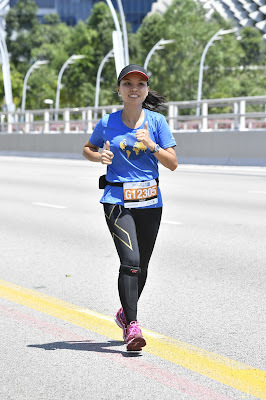 Aside from the magnitude distance of marathon - 42.19km or 26.2 miles which is by itself already a humbling reality to a petite-figured girl like me, marathon has thought me resilience and patience. How flexible I am enough to unlearn my old running tricks that does not help and learn new things I can apply to my run. While you need enough confidence, you also need to accept your deficiencies so you can start improving from there. 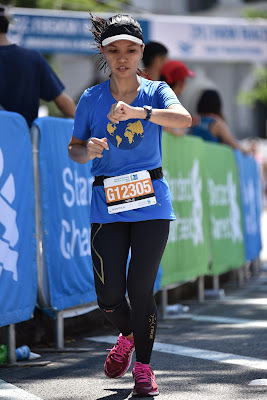 Marathon also stretched my patience through waiting for my leg muscles to fully recover after the run, this means walking slowly and carefully for the next 3 days while my sore muscles are trying to recover. Marathon does not begin in the START line, marathon was conceived the moment you decide in yourself that you're going to do it. It was born the day you started training, because the real marathon is the training. Your marathon journey begun from your rigorous training of short and long distance run, speed training, circuit and cardio exercise. The actual running event is just a demonstration of your training effort. Struggles like waking up early(as in 2am) on the actual day to catch the 3am bus to the drop off point. Running under the scorching heat of sun for several hours. Approaching a hydration point which runs out of water. Having your first day of period after more than half way of your marathon. Earphones malfunction on the actual run. While all of the above are enough reason to be irritated, I choose to face them head on and remind myself that I am already in this battle might as well enjoy it. Few years from now, you might not be able to remember the unfavorable situations you've been through but you will always be a marathon finisher. Your training enables you to learn more about your body. When likely you get leg cramps, which socks to use to avoid blisters, when your leg or ankle likely to hurt, which shirt or undergarment is comfortable. Things you discover early during your long distance run training allows you to be in better shape on the marathon day itself. Your body can achieve, what your mind can conceive. Marathon is not only building physical strength but also mental stamina. Just like how you invest training your body, spend time promoting your psychological preparedness as well because on the actual day when your legs already give up on you, your mind can get you to the finish line. This day is not a good day to be adventurous. A day before the run, just eat what you are used to eat, do not experiment. On the actual day, do not wear anything new - new shoes, new clothes or new gear. Stick to old apparels you have used before while training. This will not only save you money but will also save you from unforeseen disaster like upset stomach or nasty blisters from new shoes. Train and know your pace then stick with it. Do not start strong and faster than your usual pace just to exhaust yourself early on the game resulting to less energy at the end. Running constantly at your pace can save you from unnecessary leg cramps. Keep your pace and finish strong. Commitment of your time, energy and resources. There might be weekend gathering that you need to skip because you are following a training schedule. There could be other physical activities that you need to let go because you're committed to workout routines. There will be necessary running apparel or gears that you need to purchase because it will provide optimal marathon experience. Whether you are giving away your time, energy and resources to marathon, in return marathon gives you back a rewarding sense of accomplishment, confidence in your body and inspiration for others. At mile 22, I wish I was dead. At mile 26.2, I realized I had become too tough to be dead. Finally marathon does not end in the finish line because post-marathon recovery is equally critical. But while the pain of sore and stiff leg muscles can be disabling, I also learned that pain is temporary. With proper nutrition and recovery tricks you'll be back to your normal routine - a stronger and fitter version of you.